Larry Madowo, NTV's The Trend host has once again caused ripples on social media. Of late, he has been getting even with all those who have been criticizing Kenyan journalists. One thing I like about him is that he is always straight to the point. A few days ago, he indirectly responded to Chris Kirubi, a business mogul in Kenya who owns Capital Fm and 51% of Centum among other investments. Chris Kirubi had claimed that some local journalists are half baked and they ask “pathetic” questions making them not get a chance(s) to interview big wigs. 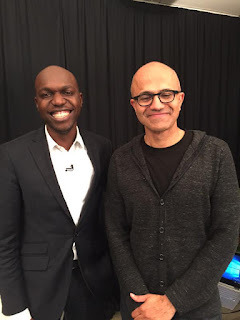 Yesterday, Larry got into a heated exchange with one of his fans who claimed that the Microsoft CEO is in Kenya and yet Larry Madowo has not yet interviewed him. Here is what transpired. Satya Nadella being in Kenya to launch Windows 10, Kenyan media.SMH." than I am, so go on"